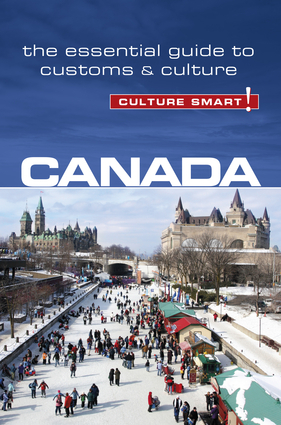 Canuck (/kəˈnʌk/): an affectionate or friendly slang term describing a person of Canadian nationality. 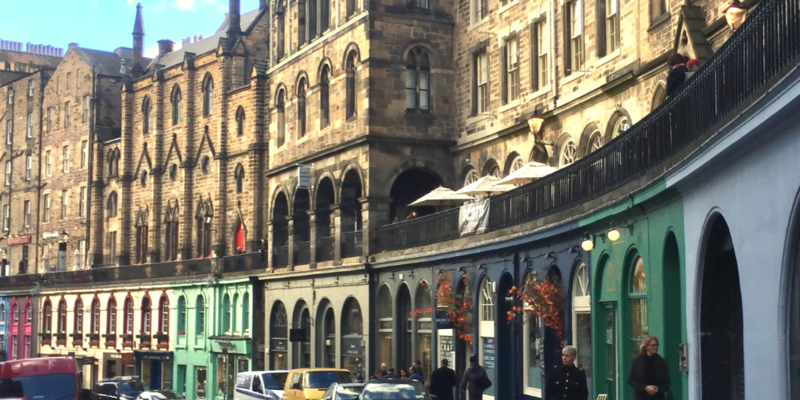 My life in Scotland began this past September, when I arrived to begin my MSc Publishing course at Edinburgh Napier University. In most cases, international students are encouraged to arrive early enough to take part in what’s called ‘Induction Week’ where they get to mingle with other students from abroad, connect with their programme directors and fellow cohorts, and learn more about the country they’ve just moved to. However, I was unable to attend this culture-shock-transition-week due to a close friend’s wedding. In 48 hours, I went from being a bridesmaid, to flying over the Atlantic, to taking notes in my first lecture of postgraduate school. Suffice to say that the rest of September was a very busy, very exciting blur. 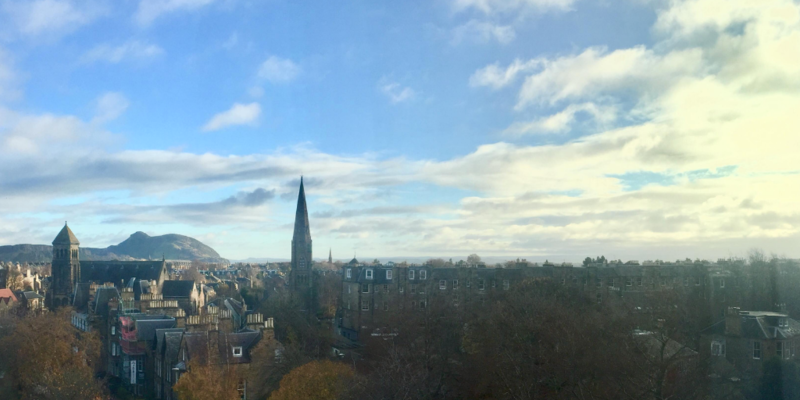 View from my classroom of Arthur’s Seat. Once the jet-lag subsided, I found myself exploring the city on foot. In those first few weeks, discovering my new surroundings this way allowed me to gain a feel for the city and its local people. While the public transportation system in Edinburgh is excellent, walking continues to be my preferred method of transit. I believe that learning to navigate the city by foot helped to improve my confidence and played a huge part in how at home I felt in only a matter of months. 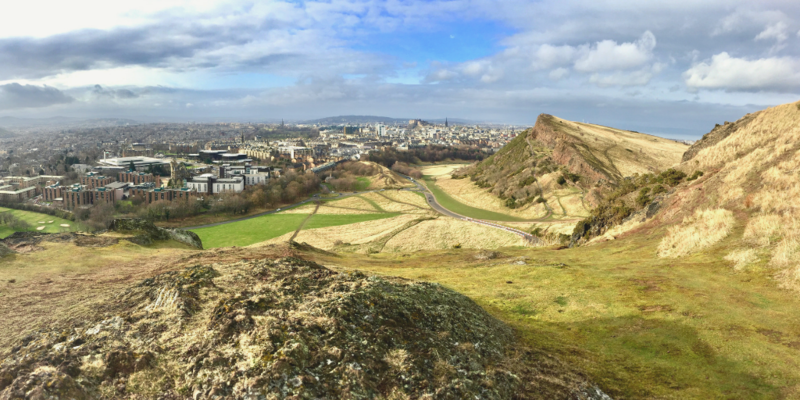 View of Edinburgh after hiking up Arthur’s Seat. Although I’m from an English-speaking country, I sometimes say words or phrases that aren’t commonly used in the UK. Through listening to people converse around me, and speaking with my Scottish classmates, I tweaked my North American terminology ever so slightly. I now understand that a line-up is a queue, trash is rubbish, a vacation is a holiday, and a hoodie is a jumper. Only once did I make the mistake of calling football “soccer” and was promptly corrected. By being more conscious of my vocabulary, I’ve managed to lessen the “oh-what-an-adorable-foreigner” looks I get from people. It also took some time to tune my ear to the unique accent and various regional dialects. 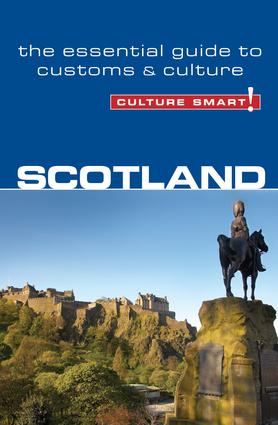 Scottish people, while very friendly and down-to-earth, tend to speak quickly. Thankfully, locals were happy to repeat themselves if I hadn’t quite caught what they’d said the first time. Cue foreign pedestrian culture-shock moment: Where I’m from, vehicles are driven on the opposite side of the road, and steering wheels are on the left-hand side of the car. This meant I was constantly looking in the wrong direction before crossing any street, and as a result, have narrowly avoided getting run over on a few occasions (I’m so sorry to all the drivers I’ve annoyed, I promise I’m learning!). That said, I am extremely grateful for those crosswalks at intersections that have “Look Left” or “Look Right” painted down at my feet. The colourful shops of Victoria Street. Adjusting to a new climate is often one of the main challenges for anyone moving abroad. Something that I braced myself for but am still adapting to is the UK’s rainy yet changeable weather. It can go from raining and windy, to sunny with clear skies (or vice versa) in a matter of half an hour. Coming from the province of Ontario, I’m used to winter weather getting as frigid as -25 degrees Celsius, while still enjoying summer temperatures that reach as high as 35+. Though I can’t say I miss the cold, the ice storms, or shovelling snow, the thought of little things like skiing, or playing hockey on a frozen lake sometimes make me miss Canada. 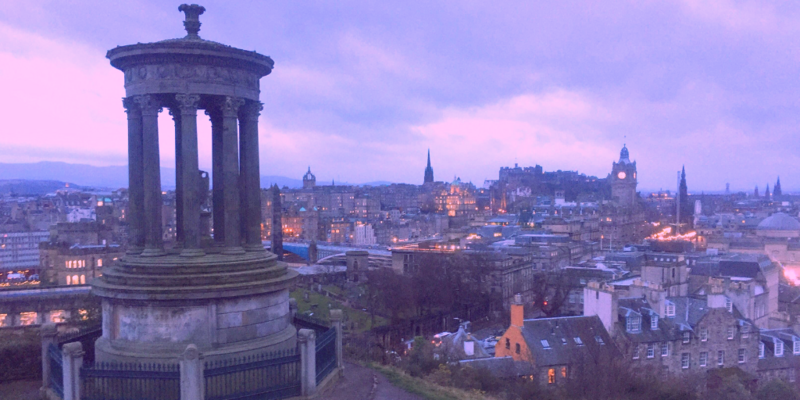 Catching an early sunrise atop Calton Hill. 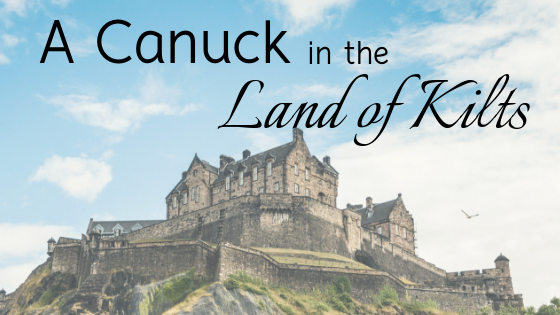 Over the last six months I’ve fallen in love with the rich history, natural beauty, and overall charm that pervades the capital city of Scotland. I’ve experienced so many “firsts”; from Irn Bru, to haggis, to Hogmanay, Burns Night, and Ceilidh dancing – it’s been a cultural whirl-wind. While I know that adjusting is an ongoing process, I’m happy to say that moving overseas has been the best decision of my life.